Wilson’s Warblers dance around willow and alder thickets, often near water, to the rapid beat of their chattering song. 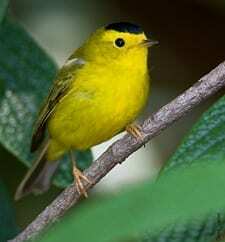 This bright yellow warbler with a black cap is one of the smallest warblers in the U.S. and among the most recognizable. They rarely slow down, dashing between shrubs, grabbing insects from one leaf after another, and popping up on low perches to sing. Wilson’s Warblers breed in mountains and northern forests, but pass through every state in the lower 48 during migration—so be on the lookout when they are on the move in the spring and fall.